- Any - A-Ztech Ltd. Anacom Eletrônica Ltda. Artedas Europe SARL Artedas France SARL Artedas Italia SRL Benchmark Systems (S) Pte. 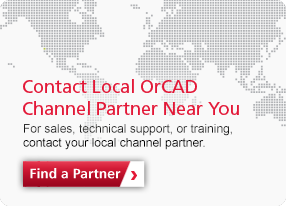 Ltd. Cadence Design Systems, Inc CB Distribution BV CB Distribution Southern Europe, S.L. Comtech Digital Technology ECAD Tools EDA Integrity Solutions Ltd (EDua) EDA Integrity Solutions Ltd. EMA Design Automation, Inc. Entuple Technologies Pvt. Ltd. FlowCAD EDA-Software Vertriebs GmbH FlowCAD Poland Sp. z o.o. Sp. K. FlowCAD Poland Sp. z o.o. Sp. K. FlowCAD Schweiz AG FTD Automation Pvt. Ltd. FTD Solutions Pte. Ltd. GATEline AB Graser Technology Co., Ltd. Innotech Corporation Maojet Technology Corporation NINEPLUS IT Co.,Ltd Nordcad AS (C/o Regnskabspartner AS) Nordcad Systems A/S (Denmark) Parallel Systems Ltd. PCB Soft Veritytechnology Korea Inc. Benchmark Systems (S) Pte. Ltd.
CB Distribution Southern Europe, S.L. Countries Served: American Samoa, Barbados, Canada, Dominica, Dominican Republic, Grenada, Jamaica, Martinique, Mexico, Saint Lucia, Saint Vincent and the Grenadines, Trinidad and Tobago, United States, Virgin Islands, U.S.
FlowCAD Poland Sp. z o.o. Sp. K.